Last Friday, 15th December, was the anniversary of the 1944 disappearance of Major Glenn Miller, Lieutenant Colonel Norman Baessell, and pilot Flight Officer John Morgan, on board a UC-64A Norseman, AAF serial 44-70285. The aircraft departed from RAF Twinwood Farm near Bedford (England) en route for Paris (France – one article mentions a Ninth Air Force airfield at Vélizy-Villacoublay) but disappeared presumably while flying over the English Channel. No wreckage or bodies were ever found. Conspiracy theories abounded through the years, many of them stretching the reader’s indulgence beyond endurance. A 2014 article in the Chicago Tribune (actually reviewing an episode of the PBS series “History Detectives”) reported that despite the many theories that had been proposed, Miller’s plane probably crashed because of icing in the carburettor. The Pratt & Whitney R-1340 Wasp used a two-barrel Stromberg that was prone to icing, and carburettor heating sought to rectify this. The key person in the Tribune article, the PBS show, and most of the other articles I’m going to cite is Dennis M. Spragg. Spragg is Senior Consultant at the Glenn Miller Archive in the American Music Research Center at the University of Colorado, Boulder. 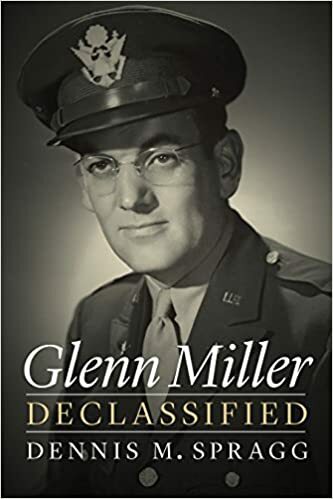 He’s just published a book entitled “Glenn Miller Declassified” (Potomac Books, September 2017) which, according to the Amazon reviews is a tad dry, but which has a lot of documentary detail. I must get hold of a copy of this book, since it piques my librarian, historian, airplane nut and Glenn Miller fan interests simultaneously – a rare enough event. According to the various reports in news articles and interested websites, Spragg’s book answers a few questions and advances my personal favourite theory of history – that the most mundane explanation is probably the most likely to be true. The conspiracy theorists will be left grinding their teeth. Glenn Miller was not on a secret mission under orders from Eisenhower. His body was not dumped outside a Paris brothel following his capture by German special forces. He was not blackmailed or repatriated to the USA under arrest and tried for black market activities, racketeering, or anything else. Miller’s Norseman was not struck by bombs jettisoned from a returning force of RAF Lancasters following a cancelled raid. The mundane explanation, an iced carburettor, and a crash in the English Channel, is Spragg’s proposed solution. One of the conspiracy theory books I read years ago stated that Miller’s plane couldn’t possibly have left from Twinwood Farm because the airfield was closed for flying on 15th December. Morgan was apparently denied permission to undertake the flight due to the appalling weather and low cloud. Miller had been delayed for two days already. Spragg apparently says Baessell simply overruled Morgan on his own authority and ordered him to proceed, despite the fact that Morgan (who was not an experienced B-24 pilot with a completed tour of operations behind him, as one theory states) was not qualified for instrument flying. Baessell seemed to have been able to authorize his own flights before and did it again, either disregarding or not being aware that his authorization was not valid in these circumstances. Spragg’s evidence includes the handwritten log of of a plane-spotter named Richard Anderton (now sadly deceased) who was living in or around Maidenhead at the time and who observed “1 Norseman going ESE” on the afternoon of 15th December 1944. Continuing to head ESE from Maidenhead would, in my estimation, make the Norseman cross the coast somewhere around Folkestone or Dover and give the pilot the shortest possible channel crossing. Obviously we have no way of knowing what course Morgan may have taken after overflying Maidenhead. If Richard Anderton had spotted Miller’s Norseman flying ESE, and had it stayed on that course – Anti-Aircraft defences notwithstanding, it would tend to discount the theory that the Norseman was struck by a bomb or bombs jettisoned by RAF Lancasters of 149 Squadron returning from an aborted bombing raid on railway yards at Siegen, Germany. The “Lancaster” theory says that Morgan would have flown south-south east or south from Maidenhead (avoiding London) to leave the English coast at Beachy Head in order to avoid the heavy Anti-Aircraft defences on the south coast of England. The attraction of this theory is that a straight line from Maidenhead to Paris passes over Beachy Head and into or close to what was known as the Southern Jettison Area. The Southern Jettison Area used by 149 Squadron that day, was located at 50º 15’N 0º 15′ E. One of the 149 Squadron crewmen said in a 1985 interview that it was “near” Beachy Head, but actually the zone is midway between Beachy Head and Le Havre). The Air Historical Branch of the Ministry of Defence record that the raid on Siegen took off at 12 noon. Miller’s plane took off from Twinwood Farm at 1.55pm and was spotted by Richard Anderton before 3pm. The AHB said in the 1985 article that Miller’s Norseman and the Lancasters may have been “many miles apart.” It would be informative to know when 149 Squadron were recalled and what course they took to the Jettison Area. It’s entirely possible that the returning Lancasters may have hit a low-flying aircraft when they jettisoned their bombs. There may be no record another light aircraft incident on December 15th, but there appears to be no official record of Baessell’s unauthorized flight with Morgan and Miller either. This, says Spragg, is part of the reason why the USAAF was so slow in announcing Miller’s death. They couldn’t believe they had simply lost someone like Glenn Miller. Until someone hauls up an identifiable piece of wreckage from the English Channel we will never know. As you can imagine, no photographs exist of 44-70285, leading to some speculation as to how it might have looked on the day Miller, Baessell and Morgan took their fateful flight. Opinion is split on whether the Norseman was in an Olive Drab / Neutral Gray scheme or whether it was unpainted. Modellers have built their own versions of Miller’s Norseman both ways and differing interpretations of 44-70285 are visible on the Web. Needless to say some aircraft spotters and modellers will always associate the Norseman as being the aircraft on which Glenn Miller was lost. It would be remiss of me not mention Miller’s musical legacy and to feature a YouTube clip of Miller and the AAF band performing, although many people have done it a lot more capably than me. This number caught my attention when researching the story of Miller’s disappearance. “Jeep Jockey Jump” was restored by Mike Zirpolo in his review of Spragg’s book. See the Bibliography for a longer list of sources I consulted. Amelia Earhart – Quotes, Pictures, and Silence. I must have said something about 2017 being the anniversary year of Amelia Earhart’s disappearance. I lectured a couple of times about her (the first time was in 2011) and even gave a Pecha Kucha presentation a couple of years ago to a bemused audience at the First Christian Church in Pittsburg on the topic. What brought Amelia back to my consciousness was the fact that one of my students this semester prepared a short presentation on Earhart for an extra credit project. She apparently visits Atchison, KS quite regularly for the Earhart celebrations. It was nice to see that Amelia isn’t forgotten by the younger generation. Inspired by this, I had a riffle around the TIGHAR (The International Group for Historic Aircraft Recovery) website to see what has developed recently. An entry in TIGHAR Executive Director Ric Gillespie’s blog caught my attention. The article “Crickets and Corrections” discusses a photo which I had forgotten about, despite only being revealed five or six months ago in June / July 2017. You may have seen this photo which is preserved in the US National Archives. A program on the History Channel supposedly blew away much of the conspiracy theory and the detailed research of TIGHAR by stating that the picture shows conclusively that Amelia Earhart and Fred Noonan’s flight actually ended in the Marshall Islands, and that they were taken prisoner by the Japanese. This would have been especially aggravating to TIGHAR, who have spent many years and a a considerable amount of money trying to prove their theory that Earhart and Noonan crashed and eventually died on Gardner Island in the Phoenix Islands, now known as Nikumaroro in the Republic of Kiribati. Ric Gillespie says that some other information has come to light about the picture. Another copy has emerged in a Japanese book published in 1935, and Gillespie / TIGHAR take much trouble to examine and translate the bibliographic information showing that the photo may have been taken two years before the famous pair disappeared. Gillespie says the History Channel have pulled the show from its schedules, and indeed the History Channel website mentions that new information has come to light and that they’re investigating. Gillespie’s blog post is the equivalent of a crowd of British football supporters singing “It’s All Gone Quiet Over There” to their previously raucous opponents’ stands when their team scores. I have no doubt we’ll hear more about this. TIGHAR’s investigation has been going on since 1989, according to their website, and will no doubt continue as funds permit. They have amassed an absolute wealth of circumstantial evidence. All of it is very highly plausible, (Personally I think their explanation is the best one and the most likely) but as they admit, there is nothing which can prove the hypothesis beyond reasonable doubt. We will keep watching and waiting.